So declared activist Barbara Fair, standing on the steps of the New Haven Courthouse surrounded by a crowd of supporters, Wednesday morning. Fair came to court for an initial appearance on a charge against her of interfering with police for actions that took place at a protest on the Green on July 8; she said that rather than accept a plea deal, she plans to fight the charge in court. She said she is confident that video of the event will prove that she neither interfered with police nor resisted arrest. Fair received a new court date for Aug. 1, the same day that her nephew, DraMese Fair, will appear in court. DraMese Fair was arrested at the same July 8 rally as Barbara Fair and charged with interfering with police and disorderly conduct. Norm Pattis, who will be Fair’s attorney on Aug. 1, handled the court date rescheduling for Fair on Monday. Pattis said he is prepared to go toe-to-toe with the state over the charge. 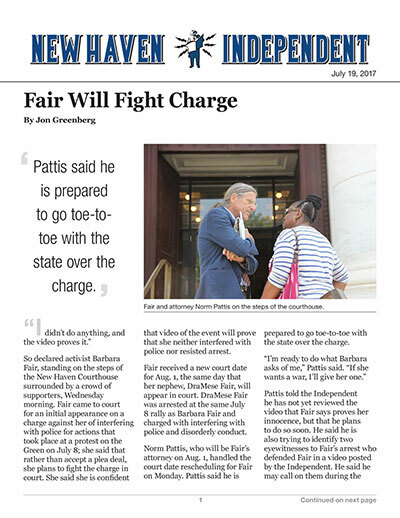 Pattis told the Independent he has not yet reviewed the video that Fair says proves her innocence, but that he plans to do so soon. He said he is also trying to identify two eyewitnesses to Fair’s arrest who defended Fair in a video posted by the Independent. He said he may call on them during the trial if he can find them. About 60 friends, family, colleagues and activists congregated on the steps of the courthouse to show support for Fair, a veteran New Haven social-justice activist. Among those present were Fair’s daughter Holly Tucker and DraMese Fair. Many of those at the courthouse on Monday had been at the July 8 protest, and some said they saw police arrest Fair or her nephew. Police said that Fair refused an order to step back while they were arresting her nephew, during a chaotic and potentially dangerous moment when counterdemonstrators had started clashing with supporters of a white-nationalist group called the Proud Boys. Fair’s supporters filled out complaint forms to the police department detailing their opposition to her arrest. Miller, who coordinated the effort to fill out the complaint forms, said at least 30 complaints regarding Fair’s treatment and another 30 regarding her nephew’s treatment had been submitted so far. He added that some people also plan to mail in their complaints, so those numbers are expected to grow. Five police officers were stationed at the intersection of Church Street and Elm Street on Wednesday morning, and others across the street. The police said they’ve been taking precaution when they see gatherings promoted on social media after being caught off guard by the clashes on the Green on July 8.